As I have told many times before, I am too stubborn to read bestsellers. I automatically distrust an author that manages to reach the New York Times top ten. I don’t even want to know who is receiving praise from Oprah. Up until now I have therefore managed to avoid Nicci French. But then someday the situation is different. I was reading my last book, I had about a week’s vacation left and hadn’t found a proper bookshop yet. After visiting a friend of a friend, she asked if we needed any books. I always do, but very much that particular day. She presented a bag full of books, after which I had to hide my disappointment. King, Grisham, Koontz and more in the same category. She recommended Nicci French, so that is the one I picked. A few days later on the airport I started reading it. In the plane I continued and the same night before going to bed I finished it. I enjoyed reading the story, I wanted to know the end. Yet, after reading it, I still wasn’t sure if I considered it a good book. It was good in respect that it made me curious, that I managed to lose myself into the book. But on the other hand, there was a certain predictability in the story, as if after half of the book, I could have told what would happen next (not until the end, but the next step). There is always debate about the difference between ‘just’ fiction and literature. Most thrillers are fiction. 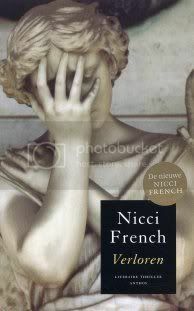 Somehow Nicci French, at least over here in the Netherlands, is being praised as a combination of literature with a thriller. In short: mother wants to take her children and her new boyfriend on a long haul holiday, yet the day they are leaving, also her birthday, is the day her daughter is missing. The vacation obviously is cancelled and mother does her own investigation, beating the sceptic police to many valuable clues. Will she find her daughter?